In the newspaper UPBEB department published a news related to the UP TET Exam 2018. 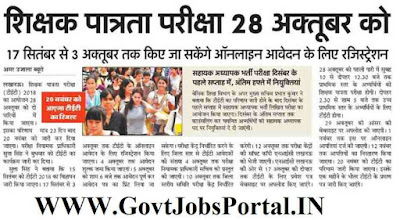 UPBEB Department conducts UPTET Exam every years to select fresher Graduates for various teaching job profiles. In the Today newspaper we come to know about this exam notification. The official notification/advertisement related to the UP TET Exam 2018 will be out on 15 Sept. 2018 and the link for applying online will be active on 17th Sept. 2018. Today on 30th Aug. 2018, they released a press News relate to this UPTET Online form. We also share the image of that Press release at the Last of this article. 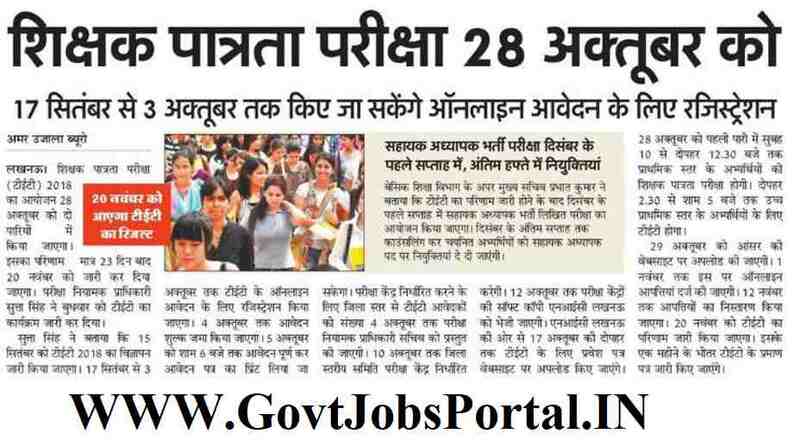 Candidates have to apply online for this UP TET Exam. We will share the link for applying online as well as the Official notification when the department published them on their official website. So bookmark this page and check it back again on 15th Sept. 2018. Read the whole article carefully before moving for UPTET Online form 2018. We share all the detail which we have related to this UPTET Exam 2018. What are the Eligibility Criteria applying this UPTET Online Form? Applicants who possess a Graduation degree with 02 years B.T.C / N.C.T.E./ 02 years Diploma (D.Ed.) (OR)12th Pass with minimum 50% of marks and must have 04 years Degree in Bachelor of Elementary Education (B.El.Ed) can apply for this UPTET Exam 2018. BA/ B.Sc.Ed or B.A.Ed/ B.Sc.Ed or Degree in Relevant discipline and B.Ed. candidates can apply. What is the Application Fee for Applying this UPTET EXAM? Those who are wishing to apply for this UP TET form, have to apply online through the UPBEB Official website. The link will be active on 17th Sept. 2018 for applying online. So wait for that date, we will share the active link on that date under IMPORTANT LINK section. There is no other method for applying this UPTET Exam 2018. Check IMPORTANT LINK Section for More detail. 30TH Aug. 2018 is the Press Release Date. 15th Sept. 2018 opening date of the Advertisement. 17th Sept. 2018 is the Starting Date to apply. 03rd Oct. 2018 is the Last Date to apply.